So I heard you like Post Script Seasons. Triangle Campaign between Cardfight!! Vanguard, Weiss Schwarz and BanG Dream! Girls Band Party! Attend the BCF2019 this year, play in the Bermuda Cup, get Vanguard Promos. BanG Dream! and Bermuda Triangle point cards on sale starting March 16th, 2019 and March 29th, 2019. 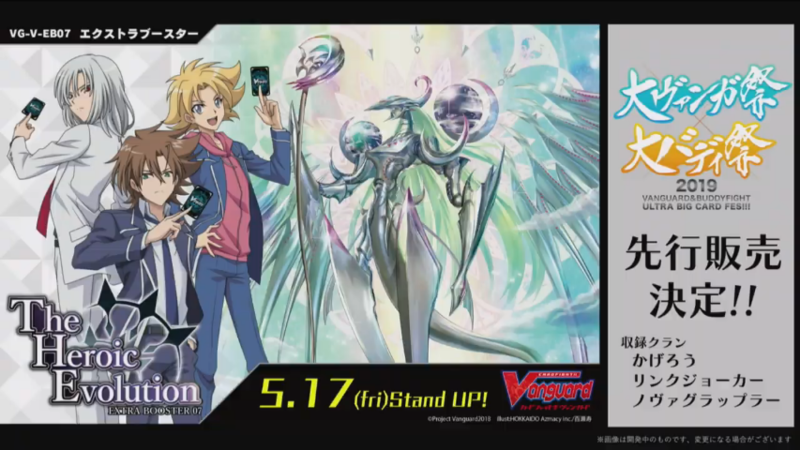 Start May 11th, the CFV anime will move into the “Further High School Student” Arc, and somehow got back on its normal TV stations, and will be airing at 8AM, every Saturday. It will be brand new material based on ideas and materials by Akira Itou. It’s a story centered on the Cardfight Club of Miyaji Academy, Kai and Ibuki, that takes placed after the Brandt Arc in Volume 12. Seasons last about 1 year for Product. Each Season will support all 24 Clans at least once. The Heroic Evolution will be coming out May 17th, 2019. It releases new G Units and Nation wide G Units that can be used in Premium Standard. The SSP Promos is promos signed by the cast members. The first theme seems to be based on “Highlander” gimmicks (i.e. using only one card with the same name). Effect listed is look at the top 10 cards of your Deck, and if there’s no normal unit with the same name, you can activate a powerful effect. The second theme of the set is Synchronization, i.e. cards with Melody gain each other’s Melody abilities. May 4th gets an unannounced card. The game follows Izuru Shidou, a character made for the video game, in a game original scenario. The character designs are by Morimoto Yuuki, who did the designs for the Neon Messiah movie and the GZ story arc. Fight with cards from the Standard Format, using the latest cards. It even uses Trial Decks from real life to get you started. The game is being supervised by Akira Itou and Bushiroad themselves.